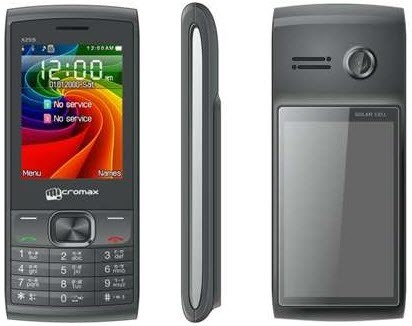 Micromax recently launched a unique feature phone with built-in solar panel. Micromax X259 is the company’s first solar phone which enables the users to charge their phone using solar energy. This handset is useful for the folks living in rural area, where they have to suffer from frequent power cuts. The solar panel technology allows the phone to automatically gets charged through solar power on exposure to sunlight. “We have been at the forefront of innovation. We have introduced many categories into this competitive Industry be it long battery life phones or dual SIM phones. With the introduction of this our intent is to get rid of the mobile phone charger by including a solar panel on the device itself”. Micromax X259 features a 2.4 inch display, sporting a resolution of 240 x 320 pixels, 0.3 megapixel rear-facing camera, dual-SIM capabilities, GPRS, Bluetooth, FM Radio, music player, solar panel, Mi-Zone, Mi-Store, 4 GB expandable memory, up to 4.5 hours of talk-time, up to 200 hours of standby time and so on. This handset also packs a 1000 mAh battery which will help you to stay connected even if you spend most of your time indoors. According to the company, this handset offers up to 1.5 hours of talk-time just by charging it under the sun for 3 hours. This handset is definitely useful for most of the Indians who are facing power cuts for several hours. Micromax X259 comes with a price-tag of just Rs.2,499 (approx. $45).